The Resilmount A96R is an acoustic isolation solution for suspending furring channel below ceiling joists, for reducing airborne vibration and structure-borne vibration in ceiling applications. A96R sound isolation clips allow for ceiling decoupling while minimizing the amount of overhead space lost. 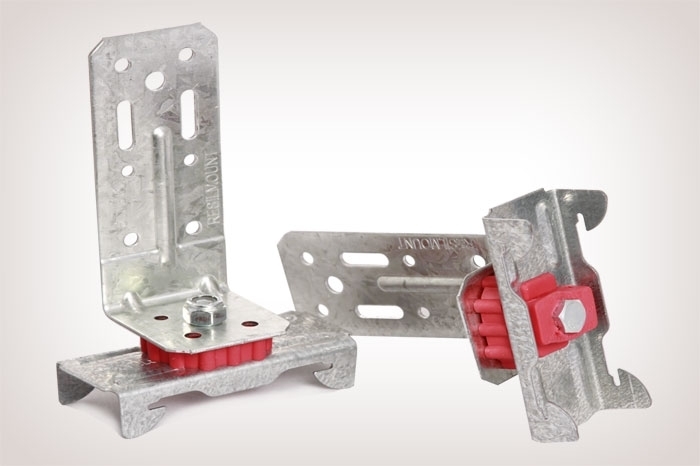 Additionally A96R clips are excellent for adding a clips and channel ceiling solution when ceiling joists are uneven, which creates installation issue for normal sound isolation clips. The simple, yet adaptable design of the A96R makes the clip an excellent choice for a wide range of unique noise reduction applications. Resilmount A96R clips are effective solutions for music studios, home theaters, and even residential housing. Any building that needs a soundproofing solution for the ceiling, yet wants to minimize the amount of space lost to the soundproofing apparatus will benefit from the use of Resilmount A96R clips. Width: 3 - 5/16 in. Height: 4 - 15/16 in. Depth: 1 - 11/16 in. 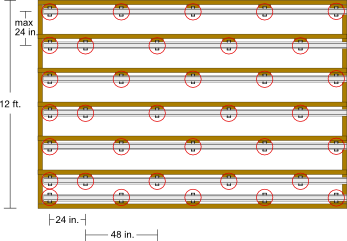 • When using A96R clips, furring channel is installed parallel to the ceiling joists. 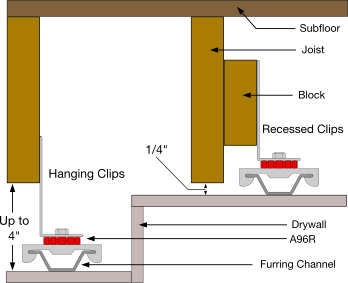 • If "recessing" the clips to minimize lost ceiling space, affix mounting blocks (as shown in the diagram), to the floor joists, and install clips to the mounting blocks. • Clips are spaced no further than 48 inches apart. • Hat channel must not be spaced more than 24 inches apart. • Make sure to leave a 1/4 in. gap around the perimeter of the ceiling to fill with acoustical caulk. 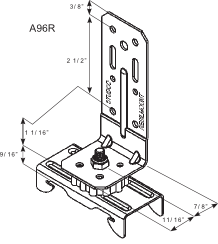 Measure for placement of Resilmount A96R sound isolation clips using layout guidelines listed in the Installation Notes above. Mark locations and install clips using appropriate screws. If desired use mounting blocks to "recess" the clips as shown in the right side of Figure 3.1. Mounting blocks should be about 6" long, with the A96R clip placed in the middle of the mounting block. Outermost clips must be spaced at every interval. Have one person lift and hold the drywall in place. Have a second installer screw the drywall directly into the furring channel using a power drill. Make sure the screws do not enter any floor joists.